Dual Pane Mode allows you to display 2 directories side by side (Vertical Split Mode), or one on top of the other (Horizontal Split Mode). Each of the directory listings can (optionally) have an Explorer tree associated with them. The screen shot below shows V in Vertical Split mode. 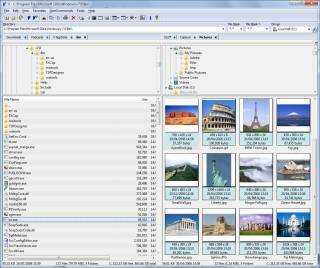 The left pane is in Details mode and the right pane is in Thumbnails mode. Digital cameras usually store extra information with the photos they take (called EXIF data). If an image contains EXIF data, V will include some of the data in an InfoTip which can be displayed by moving the mouse over the thumbnail. Below is an example of such an InfoTip.